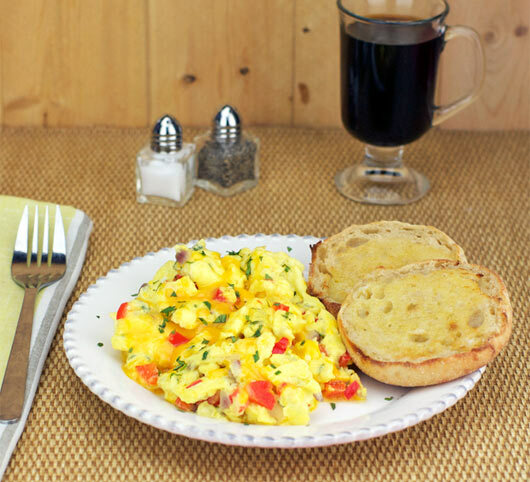 I'm not really sure why recipe submitter Tony T. called these spicy eggs. 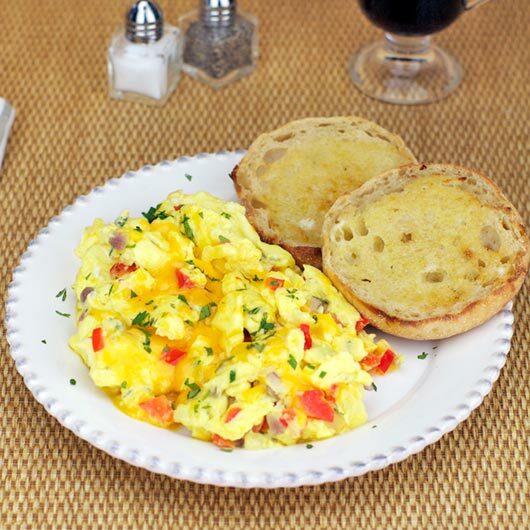 A more appropriate name would be "Easy Cheesy Veggie Eggs." If you'd like to make them spicy, I'd suggest adding a teaspoon of minced jalapeno in with chopped bell pepper. I made the recipe as submitted with two minor changes: the addition of the jalapeno and I reduced the milk to 1/3 cup. I can report that this was a very good scramble with lots of fresh flavors going on. Some people might find it excessively cheesy. Personally, I liked that. If you're concerned it's just too much cheese, I'd cut it back to 1/4 cup. This recipe was submitted in 2006. It was tested and photographed in August 2013. Melt a Tablespoon of butter in a frying pan over medium heat. In a large bowl, crack all 3 eggs. Pour the skim milk into the bowl. Whisk the mixture with a fork. Add remaining ingredients. Pour the egg mixture into the hot pan. Stir occasionally until the eggs are fluffy and fully set. You can replace the Cheddar cheese with any favorite cheese. Pepper Jack works great. If desired, you could saute the peppers and onion in butter to soften them and then add the egg mixture to that in the pan. Sometimes, I'll saute half of the vegetables and add the other half to the egg mixture so I'll get a combination of flavors and textures from the same ingredients. 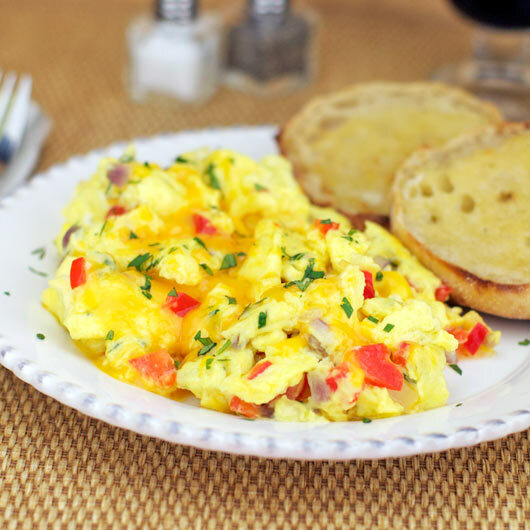 This scramble is quick to prepare and full of flavor. Featured ingredients are bell pepper, onion, oregano and Cheddar cheese. Jalapeno optional. Mr Breakfast would like to thank TONYTOCA122086 for this recipe. Recipe number 1805. Submitted 8/1/2006.